Did you know you can have a certified sewage cleanup technician at your door within an hour? It’s true. Even if you’re reading this at 2:00 a.m. on New Year’s Day, all it takes to get immediate sewage water cleanup service is one quick call to 911 Restoration of Greensboro. Expert staff are available to take your call 24/7/365, and with our guaranteed 45-minute arrival time, you can have peace of mind knowing help is closer than you think. No property owner should have to wait hours for relief from a sewage water backup. Raw sewage brings dangerous microorganisms into your home or business. Toilet water damage can destroy the structures of your property. The mere burden of sewage cleanup can take precious time out of your busy day or interrupt your business hours. That is, unless you call 911 Restoration. Our IICRC certified sewage water cleanup techs can be on the scene in an instant. They handle every last sewage-related issue, from sewage removal to full damage repair to mold inspection and remediation. Any imaginable side effect of a sewage backup can and will be remediated by your dedicated team.They’ll even help you understand your insurance benefits, file a claim, and bill your provider directly. No one can control when a sewage backup occurs, but 911 Restoration can control how it affects your day. Put our expert staff in charge of sewage water cleanup, and you can get back to focusing on the things that matter. Call us today. Who Is In Charge Of Cleaning Up Sewage? If the black water bubbling up into your basement is from the sewer main, shouldn’t the city be responsible? It may feel that way, but even if your backup was caused by heavy rains flooding the sewer system, sewage cleanup is still on you. This is because you’re responsible for the pipeline that connects you home system to the sewer main. This is unfortunate news for property owners, as the process of sewage cleanup can be complicated, not to mention horribly unpleasant. Sewage restoration involves far more than just water removal. Oftentimes, floors and walls need to be repaired after damages. Professional sanitation is an essential step. Then, there is the possibility of future mold outbreaks due to the prolonged presence of moisture. If you live in Greensboro, High Point, or the surrounding area, however, you have access to a certified sewage cleanup company that can take every last one of those concerns off your plate. There’s no need to spend extra time and money on multiple contractors to make your property feel new again. Our sewage water cleanup technicians will take care of everything, from removal to repairs to mold decontamination. 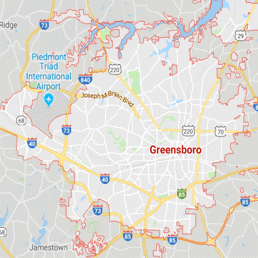 The city of Greensboro may not be responsible for cleaning up the sewage, but thanks to 911 Restoration, you don’t have to be responsible, either. Put our experts in charge and enjoy the freedom of knowing you’ve done the only job you have to do: you picked up the phone. Call 911 Restoration of Greensboro and let us take the weight off your shoulders. Sewage and toilet water damage your property faster than you might realize. Even concrete floors take on the risk of future mold infestation when they’re left to absorb water from a sewage backup. 911 Restoration offers emergency service, because we understand you can’t afford to wait when it comes to sewage cleanup. You can trust the certified technicians to arrive within 45 minutes of your call and immediately snap into action. They work fast to minimize sewage water damage, drying and dehumidifying flooring and walls to prevent rotting, weakening, and mold growth. They sanitize every inch of the area, including salvageable carpets. If you have unharmed belongings in the flooded area, your dedicated sewage cleanup crew will even pack out and store those items. From the moment they walk in the door, technicians are focused on one thing: minimizing damage by working quickly and strategically. As for any unavoidable damages that already occurred, the sewage cleanup techs can handle that, too. They tear out destroyed surfaces and replace them with new material. They even inspect for mold and remove any discovered growth. With the right sewage cleanup company on your side, a backup doesn’t have to be a costly incident that interrupts your entire day. Let 911 Restoration of Greensboro take on the burden of your sewage so you can get back to living your life. Call us now and let us offer you the relief a Fresh Start.